As I signed the last document in office, with one eye on my watch, I realized I was going to miss my flight. 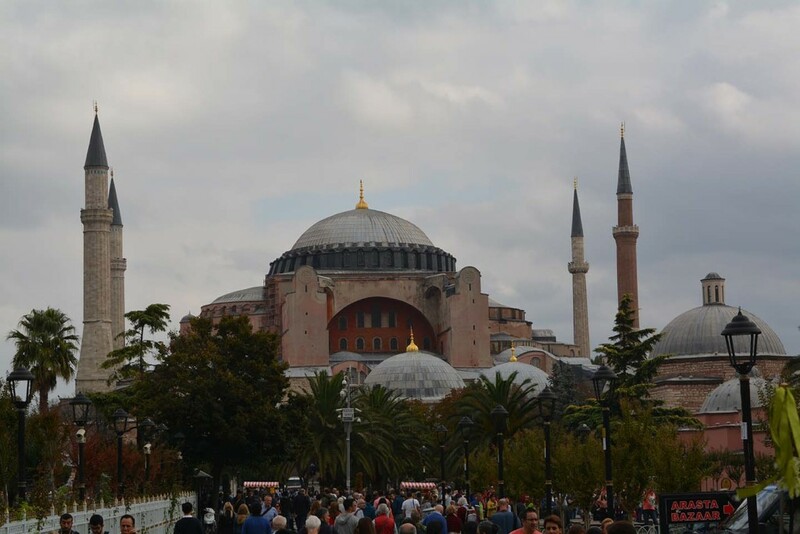 Day 1 (2nd October) : Istanbul. As I emerged from the airport into this dream of a city straddling Europe and Asia, I felt like a conqueror. 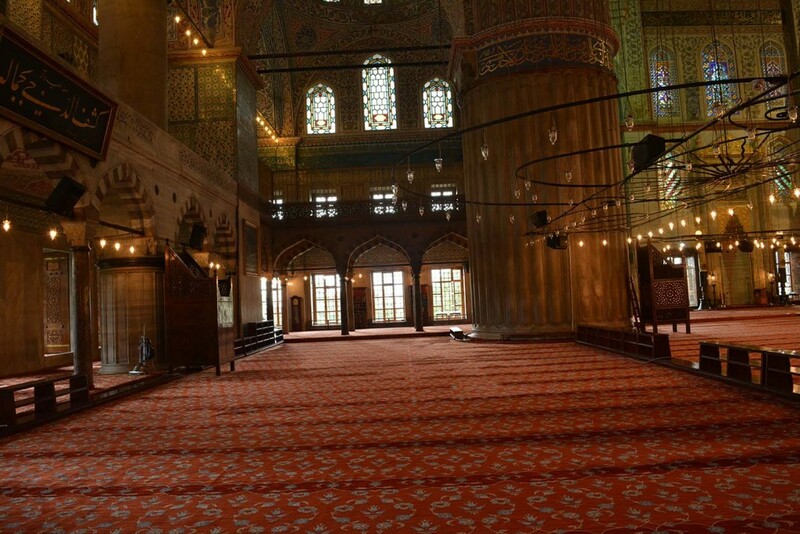 After the Greeks, Persians and Romans – I was going to discover Istanbul and make it my own. 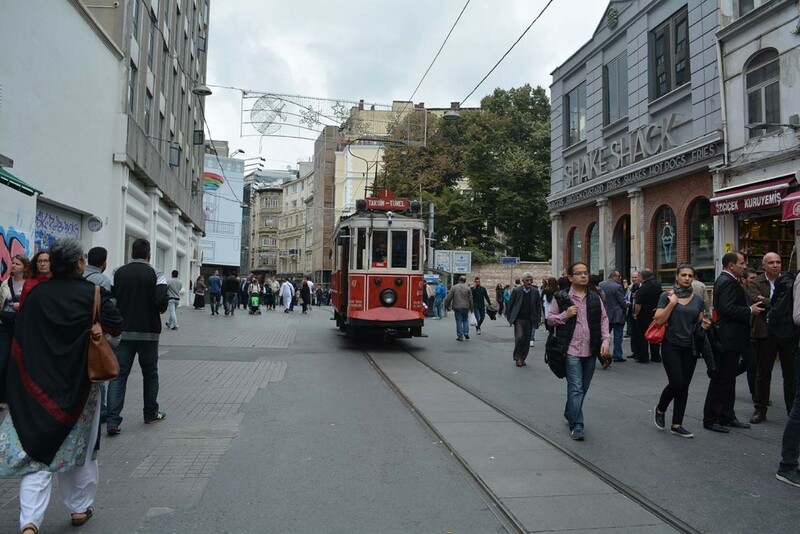 The airport is well-connected to the city-centre by the Metro and a short ride and change of trains later, I emerged into the charming Istiklal Caddesi – a high street full of shops, pubs, restaurants, pattiseries, theatres and a tram line that runs right through the middle. A quick check-in at our hotel and we were ready to step out to discover what Istanbul had in store for us. We walked down the cobbled streets, past the Galata Tower and flanked on both sides by shops selling everything touristy – musical instruments, Beautiful glass and mosaic lamps, Turkish towels and soaps, magnets, colorful Turkish carpets and kilims and mounds upon mounds of the local delicacy – Turkish Delight (or as it is known locally – Loqum). 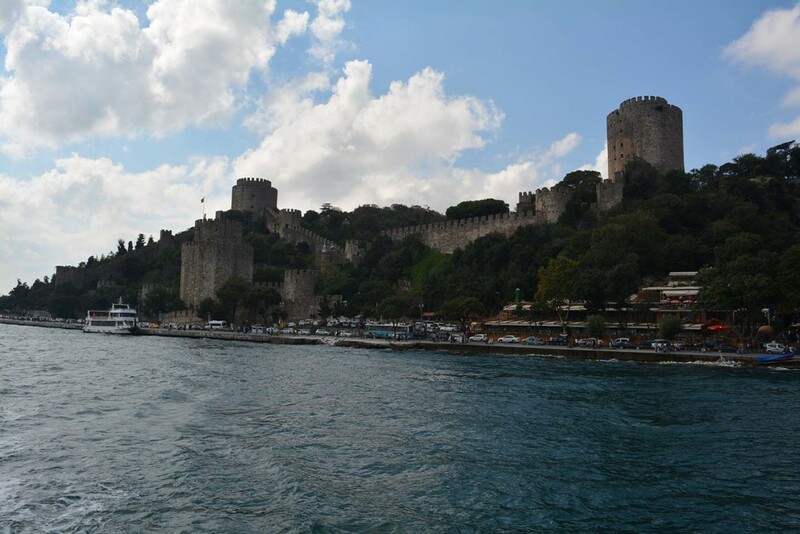 As we emerged, an estuary of the Bosphorus lay in front of us, gleaming blue – a stretch of water separating two districts of the city. We walked across the Galata bridge and saw locals with fishing rods positioned for the best catch over the bridge. 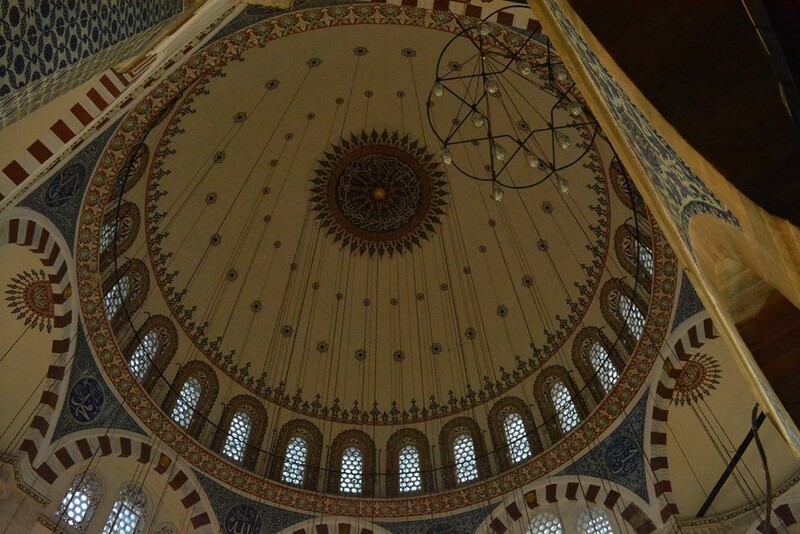 A quick stop at the Rustam Pasha Mosque with beautiful tile work in its interiors (it reminded me of the Delft Blue Pottery of the Netherlands, though the designs are very different) and a snack of Doner Kabab later, we were famished. Dinner was at a beautiful water-side restaurant under the Galata bridge, where we met Emre – our guide for the trip, but all I remember of that night is my introduction to Raki. It is the local tipple, an unsweetened, aniseed flavoured alcoholic drink that goes smoothly down one’s throat. Raki had me at hello and was my constant companion every night spent thereafter in Turkey ! 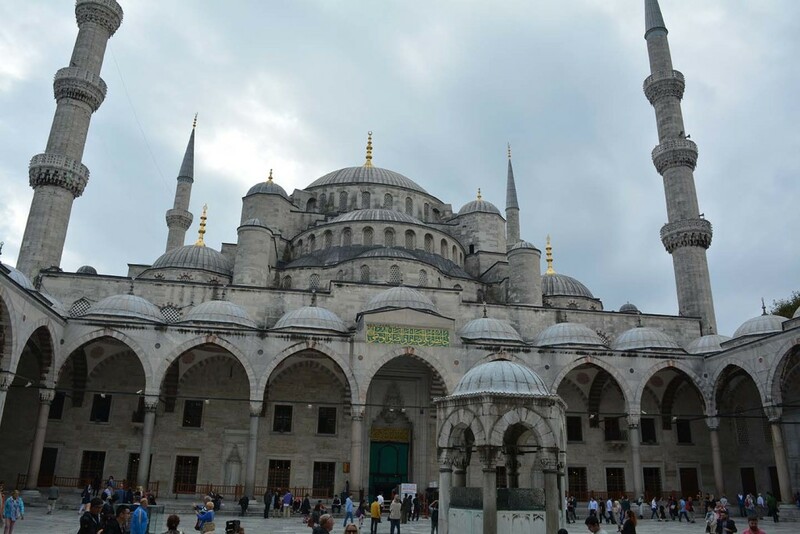 Day 2 (3rd October) : Istanbul (Old City) : Most of today would be spent wandering among the mosques and palaces of the Sultan Ahmet Square, including the Blue Mosque. To match, I was wearing white and blue today. If you are doing this on your own keep at least a day and that may still be less to take in all the magnificence that is on offer. Copious amounts of Turkish tea in small glasses were had and lunch was an interesting Turkish dish called Testi Kabab. As tasty as its name, it is cooked in a sealed clay pot and is brought to the tables and broken in front of the diners with a flourish by the waiter, the warm meat tumbling out to appease hungry palates. The day ended with a visit to the mush talked about Grand Bazaar. Like Alladin’s cave, this treasure trove contains many treasures including jewellery and leather jackets. Bargain like your life depends on it and enjoy the experience of soaking in the sights and smells of Turkish men and women selling their wares to unsuspecting tourists. 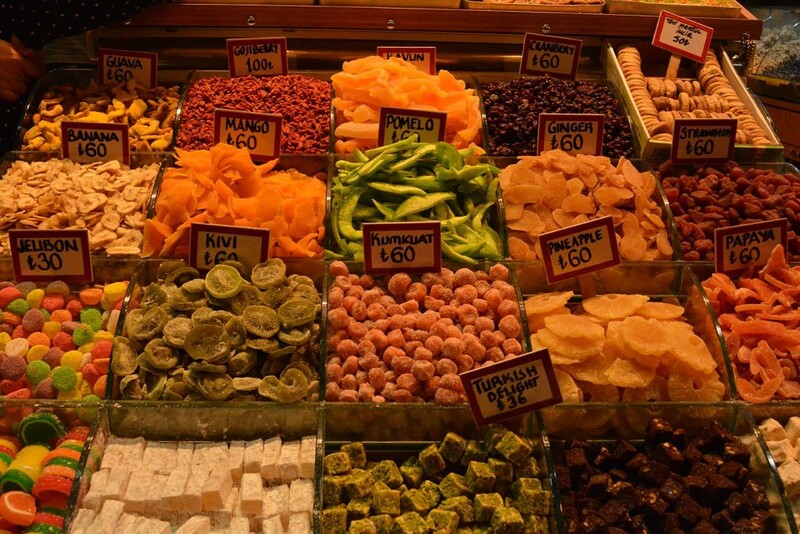 On the way back, we stopped for another Turkish delicacy – Kumpir. Kumpir is also called the Turkish Subway Sandwich….a huge baked potato that is split open, the soft flesh mashed together with copious amounts of butter and cheese and then stuffed with meat and other toppings of your choice. It’s a veritable party-in-a-potato….Thus satisfied and further fortified with raki, we made our way back to our hotel. 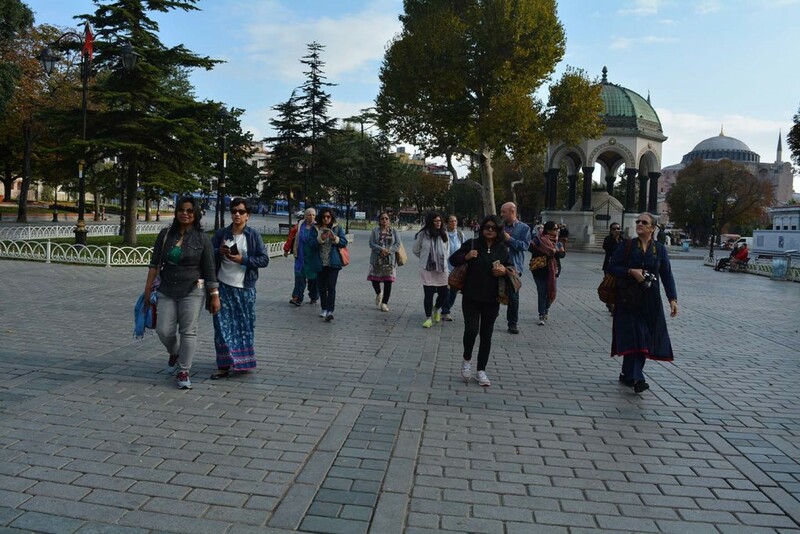 Day 3 (4th October) : Istanbul : A glorious day again, we had been lucky so far and were getting beautiful sunny weather with slight winds in Istanbul. 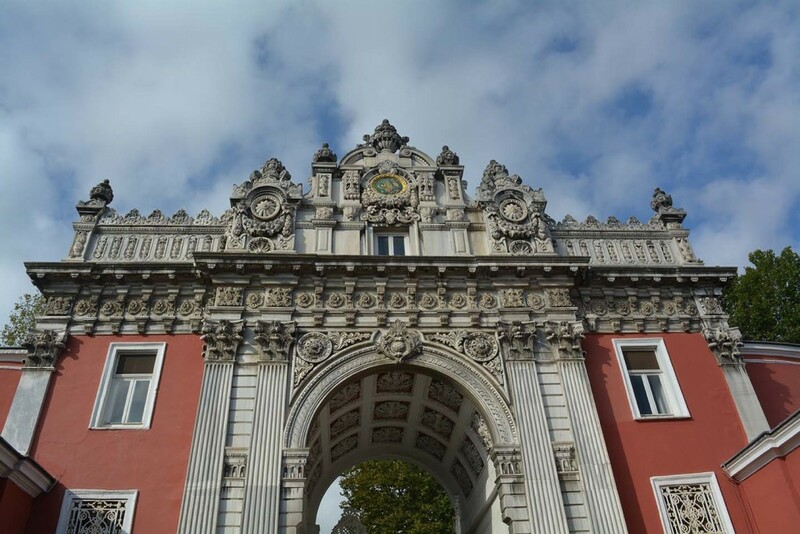 After a wonderful breakfast with a view at the hotel’s rooftop restaurant, we trooped to our bus which took us to Dolma Bahce Palace today – another outrageously lavish and beautiful palace. 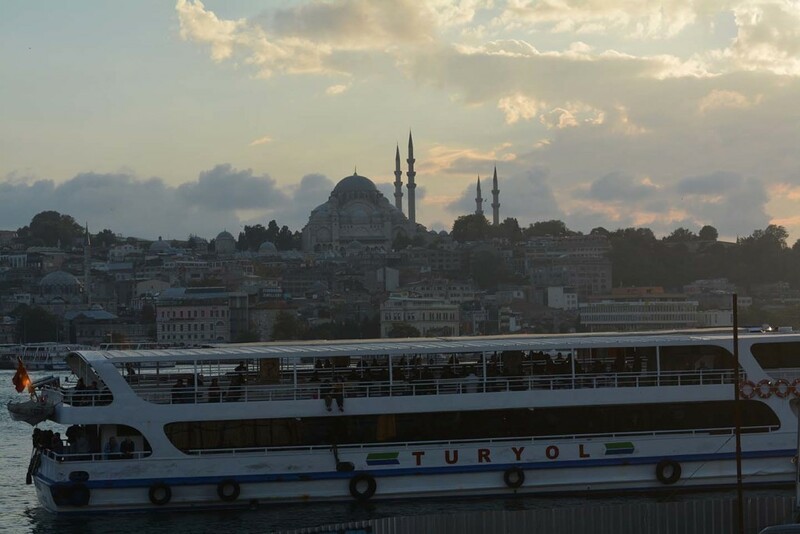 After oohing and ahing over its baccarat crystal chandeliers, we hopped over to the bosphorus for a cruise down its famed blue waters – an experience not to be missed. Lunch was at one of Istanbul’s most famous restaurants, Hamdi and after stuffing ourselves with the choicest meats, we made our way to Spice Market and the Arasta Bazaar where I was introduced to the delights of Turkish Apple tea, which I was happy to have endless amounts of. 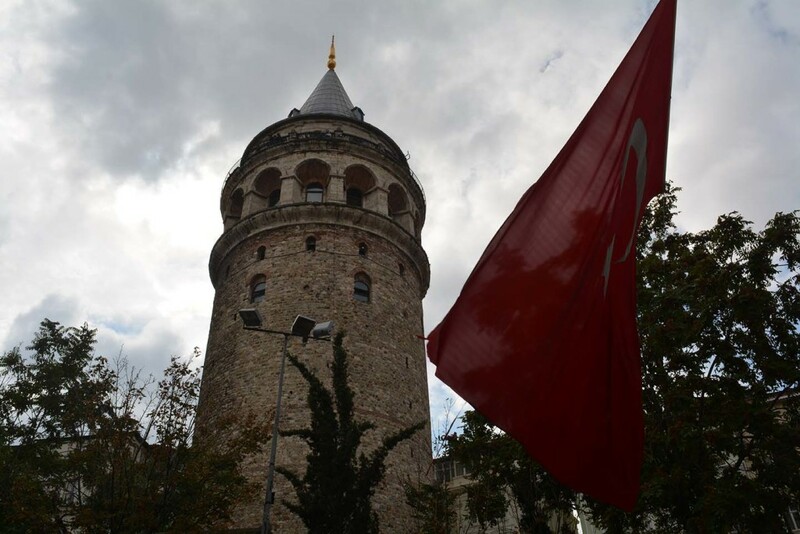 After wandering through markets we headed back to the hotel and came out for a last drink in Istanbul – I was sad to go but I knew I would be back in this beautiful city that welcomes strangers with open arms. Day 4 (5th October) : Kusadasi : We flew out of Istanbul and halfway across Turkey into the beach town of Kusadasi. Kusadasi is the stopping point for the luxury cruise ships that sail on the Aegean and also a base location for numerous day trips to places in and around Kusadasi. 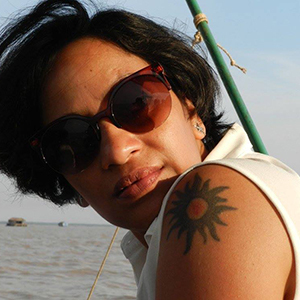 Its a quaint little beach town with restaurants and pubs dotting the seafront. On the way to Kusadasi from the airport, we stopped at a lovely organic restaurant for lunch. Fresh produce in jars, a lovingly-served 4 course meal which included Manti – the Turkish version of Yoghurt covered Ravioli, red-wine and the for desert – the largest juiciest grapes I had ever seen or eaten. 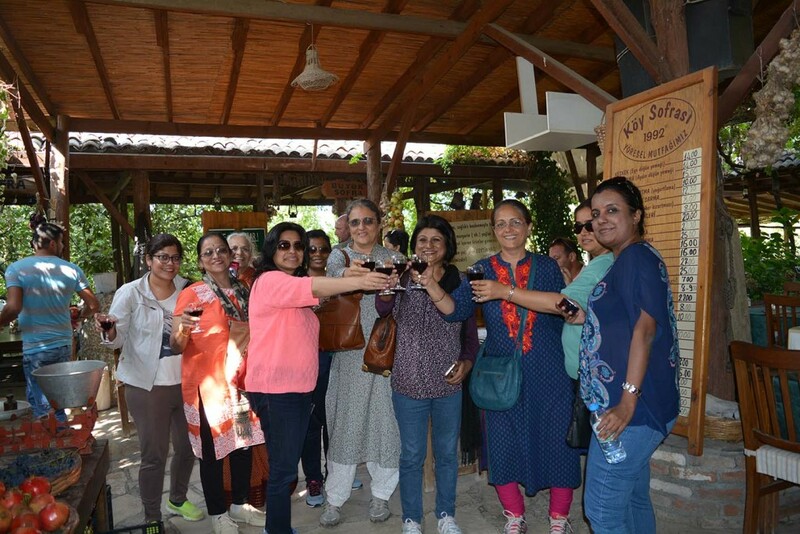 We reached our lovely hotel in Kusadasi and tired after the long journey, some of us made our way to a Turkish Hamam – the local way of taking a community bath. It consists of a large heated room with various bath kiosks. You keep your clothes in a locker, enter the hamam, take a bath in one of the open bath kiosks, along with everyone else and lay down on the large heated marble stone at the centre of the Hamam. Lay as long as you need to feel relaxed, post which one of the attendants will scrub you and bath you – leaving you refreshed. 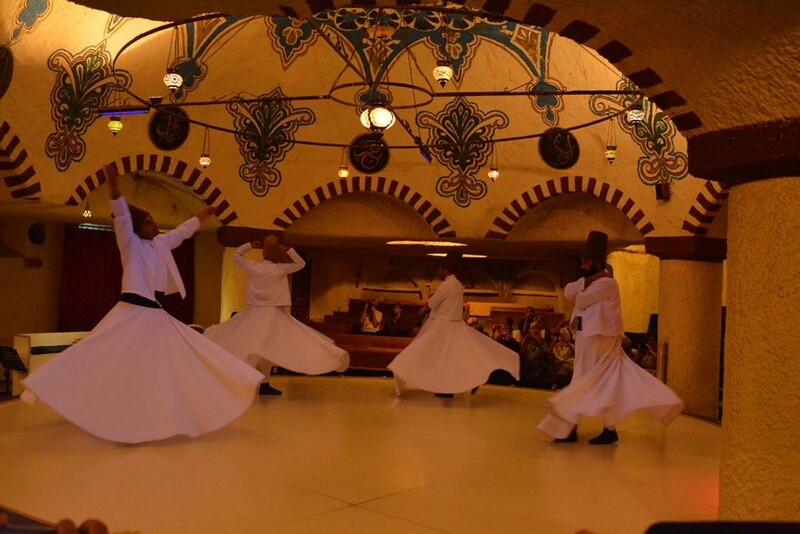 Now – here’s a quick warning – the Turkish Hamam is not for the squeamish. If you are not comfortable taking a community bath (and all its accompanying baggage), then don’t venture into it. But if you are all for trying new experiences, go for it and decide for yourself if it is for you. 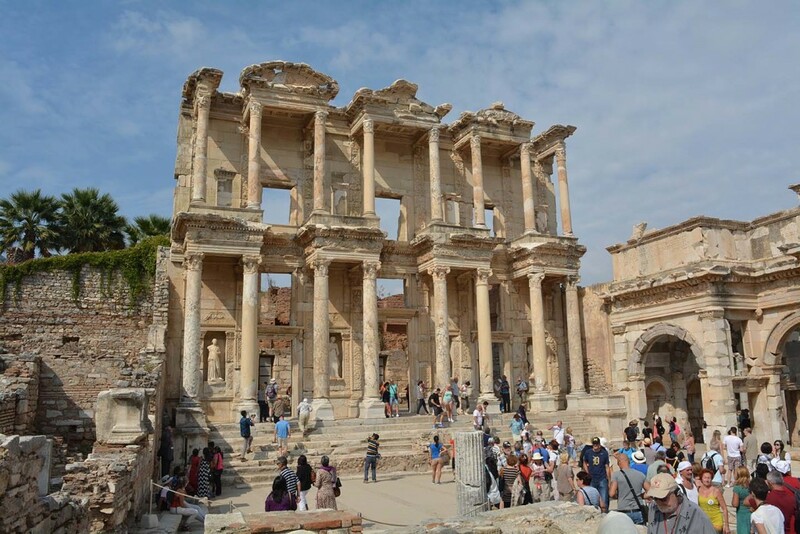 Day 5 (6th October ) : The ruins (and cats) of Ephesus : Today was spent wandering among the ruins of Ephesus. 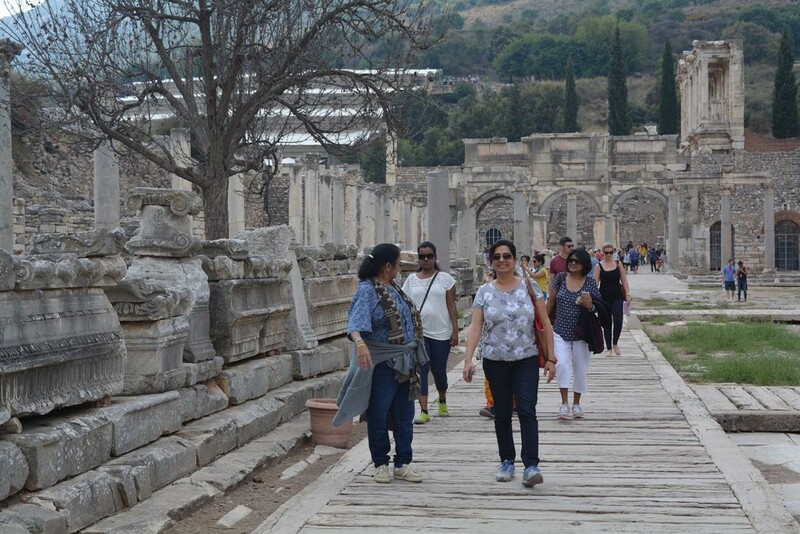 Ephesus is an ancient city in Turkey’s Central Aegean region, near modern-day Selçuk. Its excavated remains reflect centuries of history, from classical Greece to the Roman Empire – when it was the Mediterranean’s main commercial center – to the spread of Christianity. While most of the city has been reduced to rubble and a few columns, the library and Ampitheatre (remember the Farhan Akhtar – Priyanka Chopra scene from Dil Dhadakne Do ? Yes yes, we posed at the same spots) remain glowing examples of the stunning architecture. And let me tell you about the cats of Ephesus- while there are cats everywhere in Turkey – sunning themselves on carpets, sleeping in the middle of the road, curled up on benches or just watching regally as the world hurries past – the cats of Ephesus were a breed unto themselves. Running swiftly among the ruins – almost like tourist guides, perched upon broken columns like descendants of some mysterious gods or lapping water from the square holes carved into the stones, the cats of Ephesus could have told us a tale or two about the secrets of the city, if only they could talk ! This day full of history was rounded off by a visit to the house where the Virgin Mary is believed to have lived and the site where the Temple of Artemis (one of the seven wonders of the Ancient World) once existed. All that remains today is a single pillar. 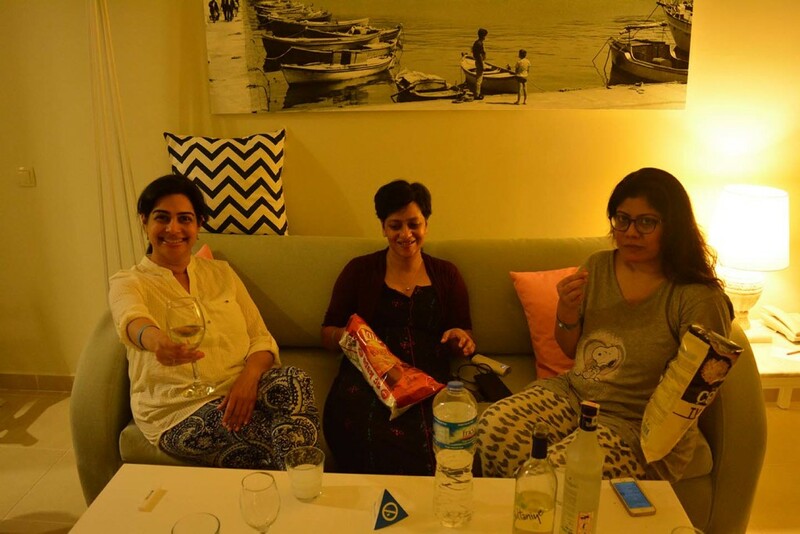 Another day well spent and another evening in the company of wonderful women ! 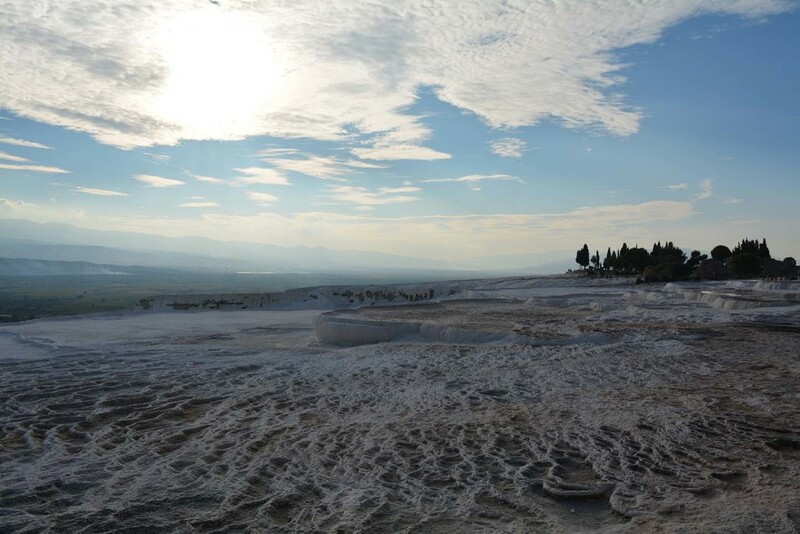 Day 7, 8 and 9 (8th, 9th, 10th October ) : Cappadocia : If you ask me to give you a detailed description of the next 3 days, I would be hard pressed to remember exact events. 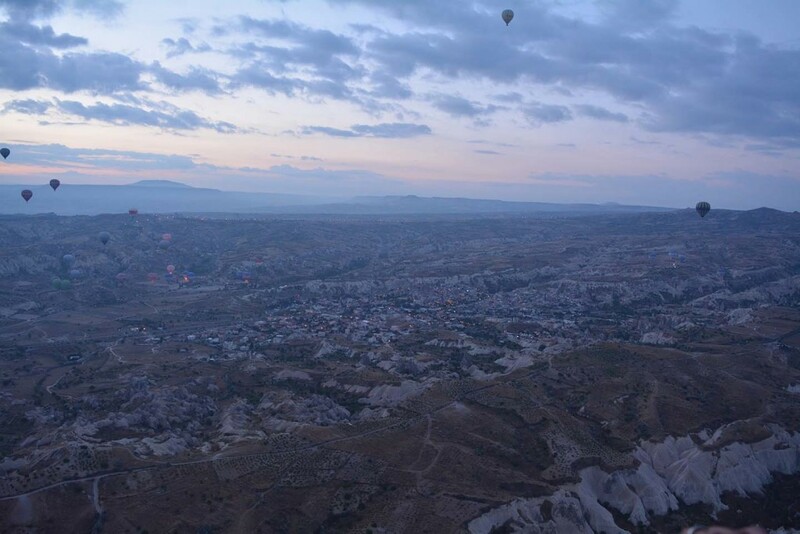 What I do remember is that I never ever wanted to leave Cappadocia. Was it the first sight of the fairy chimneys (tall, cone-shaped rock formations) that had doors and windows carved into them and people still living inside, was it the early morning hot air balloon ride (followed by champagne) over this surreal fairytale landscape, was it the performance by the Whirling Dervishes (A Sufi Order founded by Rumi’s followers) that left me strangely calm and soothed, was it a visit to the underground cities in the region that had me both fascinated and terrified at the darkness and sadness of it all, was it the kindness and courtesy of a restaurant owner letting some of us take over the kitchen to cook an Indian dish that we were desperately missing, or was it being greeted in Bengali (yes yes, Bengali !) by a Turkish shop owner who had picked up the language from his time in Bangladesh where he spent a year teaching carpet making to young, underprivileged girls or was it the unbelievably charming cave hotel that we stayed in. 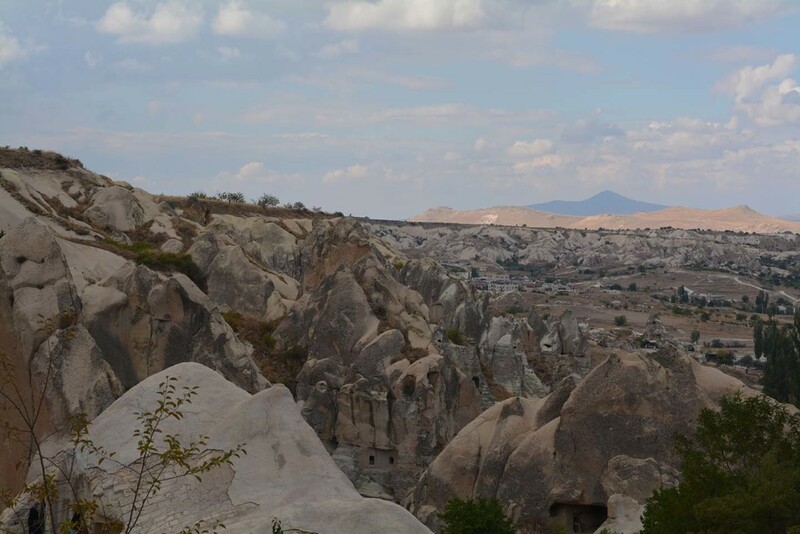 Perhaps it was all of them, perhaps it was none of them, but I do know that WHEN (not IF) I go back to Cappadocia, I will spend many more days soaking in the charm of the place. Soon it was time for us to head back home. 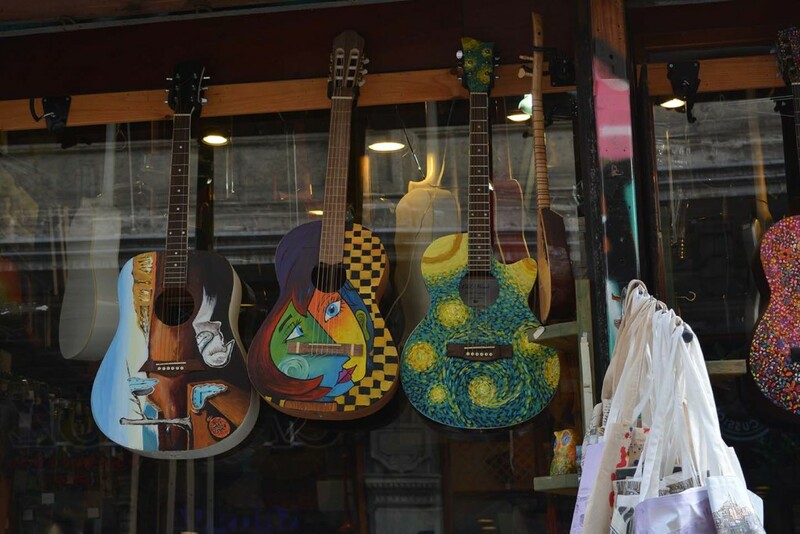 A beautiful country, warm if slightly gruff people but hearts as soft as loqum, food to die for and fabulous shopping – that sums up Turkey for me. 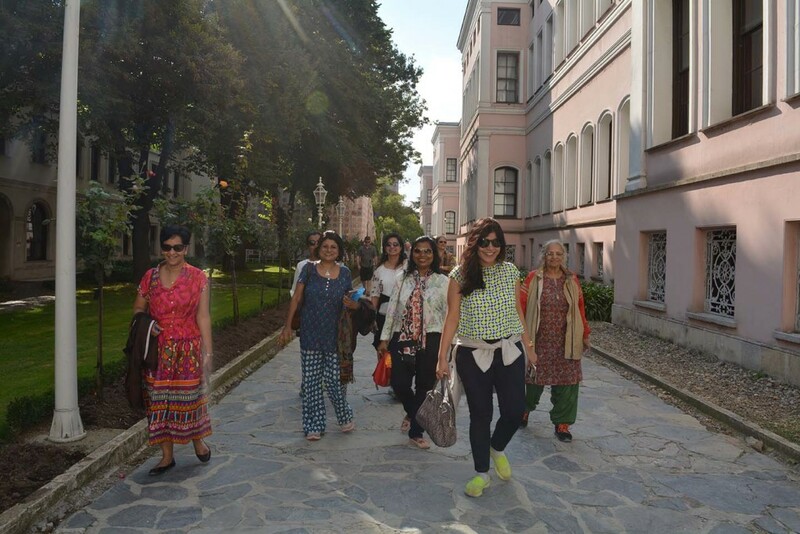 The trip had Wonderful World’s trademark touches – meticulously planned, everyone’s needs taken care of (including vegans, non-onion and garlic eating travelers and vegetarians), throwing in the unusual, painstakingly researched itinerary and hotels that shone brightly like hidden gems. And the key ingredient in this cocktail was wonderful travel companions and wonderful friends that I made. Wonderful World – cant wait to travel with you again !!! Shibani – what do you have up your sleeve next ?